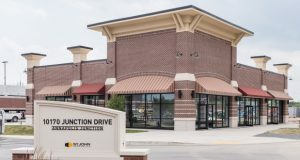 Family-owned Pepperjacks Subs has leased space with St. John Properties Inc. at the transit-oriented Annapolis Junction Town Center near the Savage MARC station in Howard County. The eatery, which features offerings including signature sandwiches, store-baked French baguette bread, and milk shakes, is Pepperjacks Subs‘ second location and is expected to open this fall. Bill Holzman, St. John Properties vice president of retail leasing represented the landlord. Bill Harrison and Austin Eber of Lee & Associates Commercial Real Estate Services represented the tenant in the deal. Earlier this year Holzman discussed how restaurant space in live, work, and play settings has been a bright spot for a retail sector that has faced its share of struggles in recent years. “When office tenants are looking for space the first question is about rent. The second is, ‘Where can we eat?’” Holzman said in April. MacKenzie Commercial Real Estate Services report on the Baltimore metro area retail sector’s second quarter performance found there were more than 8.2 million square feet of retail in the area around Fort George G. Meade with a 4.2 percent vacancy rate, which is up from 2.9 percent the prior year. The rise in vacancy is primarily due to new deliveries as rents in the area increased from $21.72-per-square-foot the year before to $23.75-per-square-foot in the second quarter. A 700-space commuter parking garage was delivered in 2016 at Annapolis Junction Town Center. Last summer Somerset Construction Co. delivered the 416 unit luxury apartments at The Residences at Annapolis Junction. Verizon Wireless also signed a 61,000-square-foot lease in February in a four-story Class A office building at the development. An additional 14,000 square feet of retail space is planned. Correction: A previous version of this story incorrectly stated the commuter parking garage’s delivery date. The structure was completed in 2016.